Mark is a five-year C# MVP Alumni with strong expertise in decoupled design and plug-in architectures. Mark is also one of the leading experts in the field of great usability and design. Mark has been researching great user interfaces since 2002. Mark is a top-ranked speaker at developer conferences around the world and has been professionally writing software for over three decades. 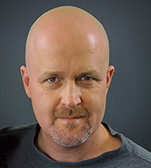 Mark is Chief Architect of the IDE Tools division at Developer Express, and is the visionary force behind CodeRush.